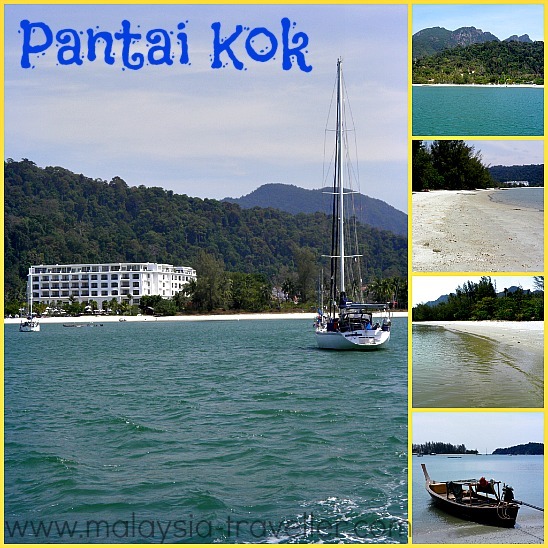 The main island of Langkawi probably has the best beaches on the West Coast of Peninsular Malaysia. There are beaches here to suit all tastes whether you prefer quiet, secluded coves or something a bit livelier with water-sports and restaurants. Of course none of Langkawi beaches are that lively - if you are looking for more boisterous pursuits you might be better off going to Kuta Beach in Bali or Patong Beach in Phuket. Langkawi is part of Kedah state which is a conservative corner of Malaysia appealing to the more discerning traveller looking for outstanding scenery, pristine beaches, fine hotels, good food and relaxing spas. 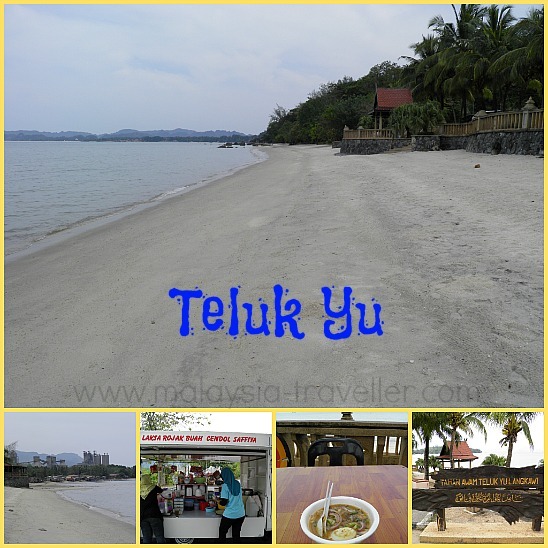 I conducted my review of a dozen Langkawi beaches in February 2013. My rankings are based mainly on water cleanliness and sand quality but I also take into account amenities such as availability of water sports, restaurants, shops, changing rooms and parking. 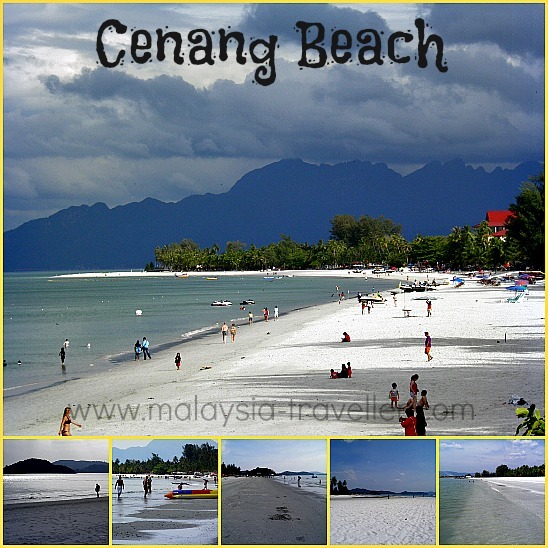 Cenang Beach (pronounced and sometimes spelt 'Chenang') is the longest beach on Langkawi and is by far the most popular and developed. For good reason. It has the finest sand on the island. The sand passes my sandcastle test meaning that you can dig holes in the sand with your fingers without getting rough, uncomfortable sand granules under your finger-nails. The sea water is generally calm, clean and refreshingly cool. The spectacular hills of the Mat Chinchang Cambrian Geoforest Park can be seen away in the distance to the north while off the coast lie the tropical islands of Rebak Island and Pulau Tepur. The beach stretches from the headland in front of the Meritus Pelangi Beach Resort (where a sign warns bathers that high waves and strong currents can be encountered) all the way south to near Underwater World. The sand quality is slightly better at the southern end (in front of Langkapuri Inn for example). Sunbeds (with beach umbrellas) can be hired at various places for RM 10 - 15 per day. In the middle of the beach is a watersports area where banana boats, jet skis and the like can be hired. Island hopping boat trips can also be arranged from here. Parallel to the beach is a busy street full of shops selling t-shirts, swimming attire, sunglasses, flip-flops, hats, snacks and drinks. There is a wide range of restaurants ranging from Malaysian, Thai, Middle Eastern, seafood, Indian, International, Mexican, Italian and more. The street also has a surprising number of spas offering Malay, Thai, Ayurvedic, Balinese, Chinese and other treatments, massages and therapies. There are also a couple of beach bars. Public toilets, showers and changing facilities are available. As for hotels, the Meritus Pelangi Beach Resort looks good. It is designed in traditional Malay kampung style. The accommodation looks gleaming and shiny after a recent renovation. Next door is the Casa Del Mar which is another highly rated resort with many of its rooms opening directly onto the beach. Most of the other chalets and inns lining the beach are aimed at the budget end of the market. I rate this as the Number 1 of Lankawi Beaches. Even though it is the busiest beach it is not crowded compared to similar beaches in other countries. Those looking for a quieter spot might prefer the following choices. Tengah Beach is really a continuation of Cenang Beach but separated by a headland on which Underwater World and other buildings have been constructed. Tengah Beach itself has two sections split by a rocky outcrop - a larger northern end, which is lined with a number of low-budget cottages and chalets, and the smaller southern end which is slightly more exclusive with two large resorts, The Lanai and Holiday Villa. 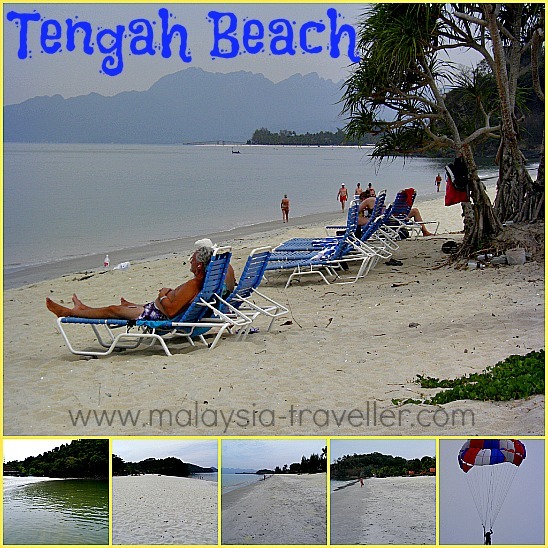 The sand quality and water quality on Tengah Beach is excellent. I preferred the end in front of the Lanai. I did see one large jellyfish washed up on the beach. Watersport equipment is available including parasailing and jet skiing. The road running parallel to the beach has a number of restaurants such as the T-Cafe and the USSR Restaurant (no doubt catering for the large number of Russian tourists who like to visit Langkawi to escape their winter). Overall however this road is less busy than that in front of Cenang Beach. As for hotels, The Lanai looks a pleasant place although perhaps somewhat dated. It seems to appeal more to middle-aged European guests. Next door, the Holiday Villa is a sprawling resort of roughly similar standard. Slightly further along the beach is the Frangipani. All three hotels are nothing special but enjoy excellent beach front locations. I rate Tengah Beach as Number 2 of Langkawi Beaches. 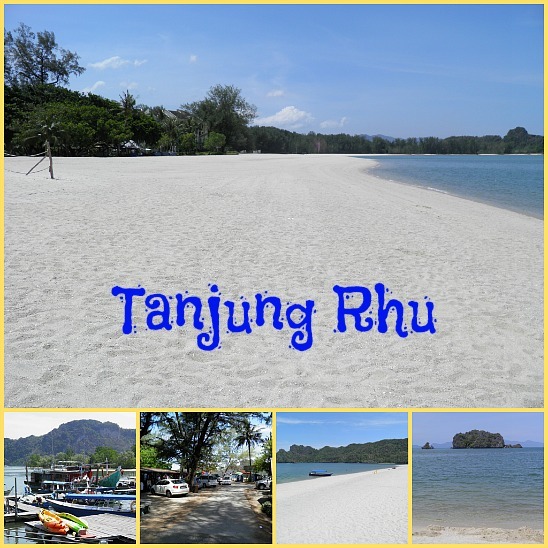 Tanjung Rhu is a narrow spit of land located in the northeast corner of Langkawi Island with the beautiful Andaman Sea on one side and a lagoon on the other. The river mouth is one of the jumping off points for Mangrove Tour Boat Charters which can be arranged here. Access to the public beach is via private property of the owners of the neighbouring Tanjung Rhu Resort. The public are required to use the Eastern side of the beach away from the Tanjung Rhu Resort. The area is closed to visitors after 7pm. There are a few shops and a couple of simple restaurants located next to the beach. The whole area is wooded with casuarina trees but the beach itself is fully exposed to the sun with no coconut palms to provide shade. The sand is not quite as fine as on Cenang or Tengah but it is a striking white colour and the sea is a bluer colour on this side of the island. 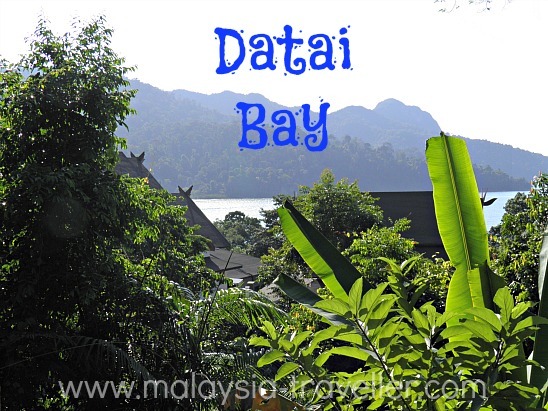 Boat rides to the nearby Gua Cerita (Cave of Legends) and to fish farms floating in the bay are popular activities here. The island of Tarutao (part of Thailand) is clearly visible a few kilometres away. Two luxury resorts are located here, the Tanjung Rhu Resort and the top-notch Four Seasons Langkawi. I rate Tanjung Rhu Public Beach as Number 3 of Langkawi Beaches. The location may not suit everybody as there are very few shops or restaurants in this part of the island. However if you are staying at the Four Seasons that will not bother you as you will probably not wish to leave your resort! There are two hotels sharing this scenic bay, the Berjaya Langkawi Resort at one end and the Mutiara Burau Bay (currently closed down for extensive renovation) at the other. The beach is excellent with fine sand and the sea is clean. A sign warns guests about jellyfish which can be an issue (not just on this beach) during the season (July - September) especially 8 to 10 days after a full moon when jellyfish congregate for reproduction. The sign advises that vinegar or salt water are the best treatments for jellyfish stings (not urine as is commonly believed). The setting is beautiful with lush landscaping at the Berjaya whose hotel rooms are built on stilts over the sea to give a romantic tropical effect to the resort. Oriental Village and the Cable Car station are located just 5 minutes walk away. Rated Number 4 beach of Langkawi Beaches. The Berjaya Resort might be regarded as too large by some. This small beach lies on the northern coast of Langkawi facing the Thai island of Tarutao which is just 5km away. An information board tells how Tarutao was used as a prison in the 1930s. 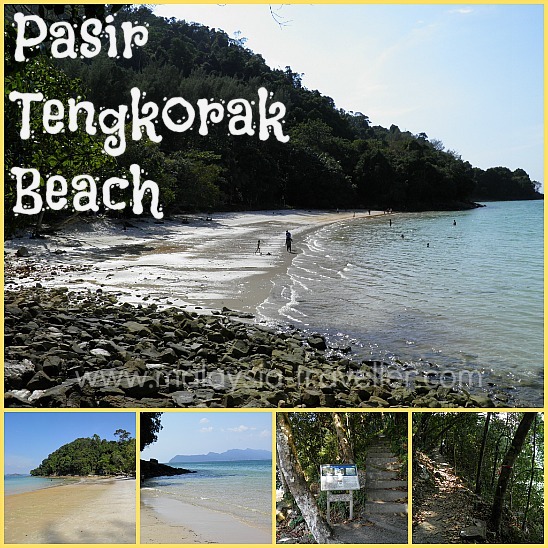 The existence of crocodiles and sharks in the surrounding sea at that time ensured that only a few could escape alive and some bodies were swept by the current onto this beach, hence the name Pasir Tengkorak which translates as Sands of the Skull. The waters around Tarutao were also known for feared pirates who raided passing merchant ships and dumped bodies of their victims into the sea. Nowadays there are no more pirates or prisoners here and hopefully not too many crocodiles or sharks either. A short coastal path and steps lead to a rocky cove. The water here is clear. The beach has a wooded picnic area with gazebos, toilets and changing rooms. 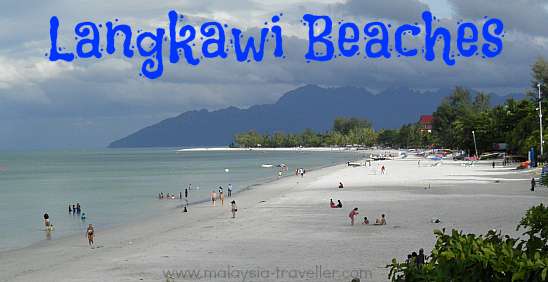 Rated Number 5 of Langkawi beaches due to its pretty setting and coastal walk. Tucked away in lush rainforest in the northwest corner of Langkawi, Datai Bay is an exclusive beach off-limits to all except guests of the two luxury resorts found here, The Datai Langkawi and The Andaman. Since these resorts have good security it was not possible to visit the beach but I am sure it is excellent. The Datai Bay Golf Club is located here. If you are a golfer or are looking for a peaceful retreat away from it all this beach could be ideal. But for those who prefer to be closer to shops, restaurants and other attractions, they might find the location of this beach to be too remote. 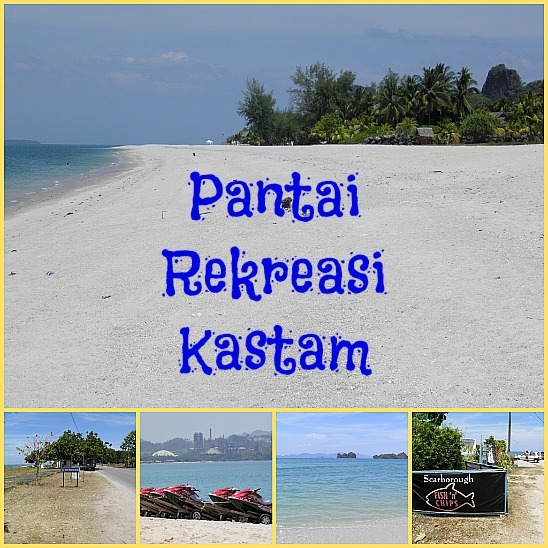 Rated outside the top 5 Langkawi beaches due to remote location. This beach, close to Four Seasons Tanjung Rhu, is named after the Customs Department office found here. As a recreational beach it has jet skis and other water-sport facilities but no natural shade or other facilities. Scarborough Fish 'n' Chips shop is found here. Good for jet skiing but prefer other Langawi beaches such as the nearby Tanjung Rhu public beach. This is a long and attractive stretch of beach shaded by casuarina trees. At the southern end are moored local fishing boats rigged with bright lights for night-time squid fishing. The Summer Palace scenes in the 1999 version of the movie Anna & The King were filmed here. The buildings created for that set were preserved for a few years until they were damaged in the 2004 tsunami. Only a few traces still remain. A stylish marina development (Perdana Quay and Telaga Harbour Park) has been constructed here with a few restaurants, shops and a luxury hotel, The Danna Langkawi. While swimming at Pantai Kok near The Danna, I was disappointed that the sand felt slimy underfoot. The guests of The Danna probably do not notice as they have a huge pool to enjoy. Construction of the man-made islands opposite the beach might have affected the sand quality on this stretch of coastline. A restaurant and outdoor seating area have been built along this pleasant public beach on the northern coast of Langkawi. The huge Lafarge cement factory just along the coast is a bit of an eyesore and leaves cars parked nearby covered with a thin layer of cement dust. Was it necessary to build a major industrial plant on Malaysia's top tourism island I wonder? If the food van is parked in the Teluk Yu car park when you visit you can enjoy a tasty bowl of laksa noodles while admiring the sea view. A nice public beach with nobody on it when I visited (perhaps because Teluk Yu means Shark Bay!). 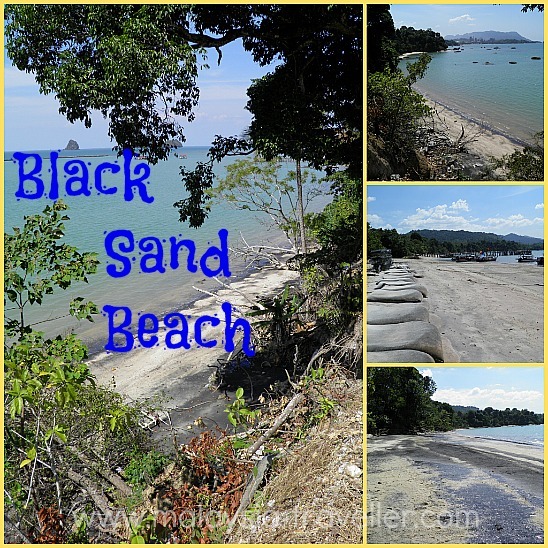 Not far from Teluk Yu is Black Sand Beach (Pantai Pasir Hitam) which is said to get its black colour from minerals in the granite bedrock. Large sandbags have been stacked up along this shoreline indicating that the beach is being affected by coastal erosion. Alongside the beach's car park is a complex with shops, stalls, food court, toilets etc. Not a bad one but there are better Langkawi beaches nearby. This beach is at Kuah, Langkawi's main town. The sea is not very inviting here and a rather scruffy beach resort mars the surroundings. Not the best of Langkawi beaches. OK for an early morning or evening stroll. The final one on my list of Langkawi Beaches is a quaint fishing village at Kuah. The Fish Farm Restaurant is a cleverly decorated and landscaped restaurant built on stilts above the water and shows what can be done with a narrow waterfront and a lot of imagination. 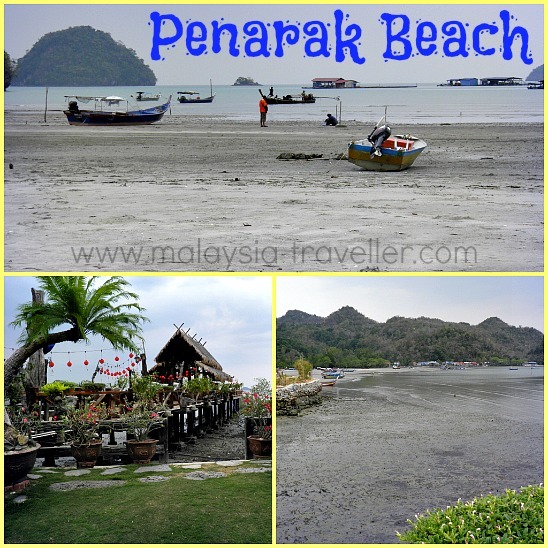 The restaurant describes Penarak Beach as Langkawi's Halong Bay. That is an exaggeration but it is a pretty spot all the same. Good for a seafood meal overlooking a scenic fishing village. Not a beach for swimming. 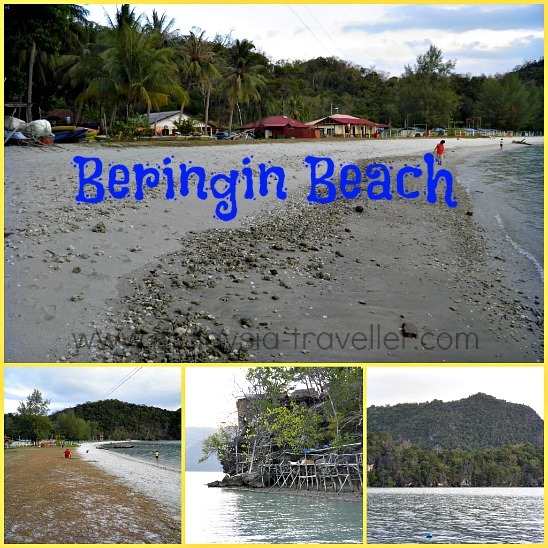 I hope you find this review of the best Langkawi beaches helpful. 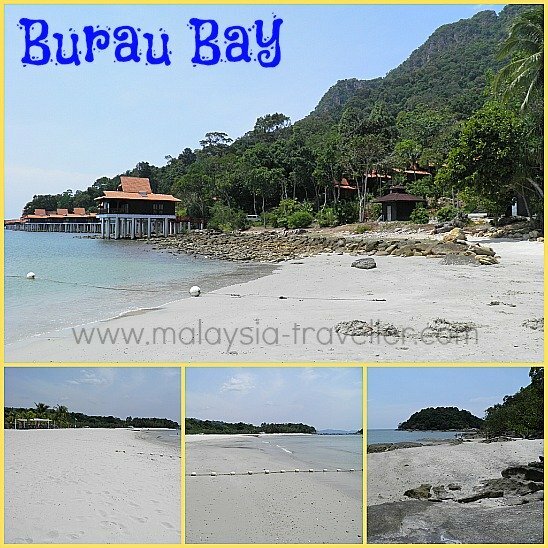 For more great Malaysian beaches click here.